Nothing can prepare you for the journey that is unfolding... The Galaxy is in a fragile state, balancing on the brink of War and Peace. New threats are emerging from the untouched regions of space that threaten with an iron grip to bring the known inhabitants to their knees. Will you aid your faction when duty calls? Or will you serve your own needs? Will you fight side by side with your comrades in an epic struggle against a hardened, blood-thirsty foe or will you go it alone, facing the perilous dangers as they approach? Do you long for the thrill of combat or do you prefer the call of merchant - always on the look out for a quick, opportune trade. Your decisions are your own, and the rewards are yours for the taking. 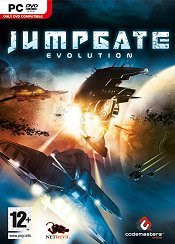 Jumpgate Evolution is a Massively Multiplayer Online Game set in the open expanse of space. With breath-taking visuals and an innovative twitch-based space combat, Jumpgate is the definitive space combat MMO, putting you at the heart of the action as you embark on your mission to explore the galaxy and progress from space rookie to elite commander. * Immense Online Battles - Enter a dynamic universe and fight alongside or against thousands of players in immense online battles. * Elite Space Combat - Adrenaline-fuelled, action space combat set within an immense persistent universe. * Player Advancement – Answer your calling as you advance your online career through endless content, ships and weaponry. * Massive Space Conflict – Use cunning military tactics as you and your squadron destroy enormous space stations and devastating capital ships. * Highly Accessible - Incredibly scaleable game engine allows Jumpgate to be fully playable, even on older PCs.